Argumentum ad populum is that the best way to beat your competitor is to one-up him. If he has 2 features, you need 3 (4 would be even better). If he is budgeting 1 x $ on his solution, you need to spend 2 x $. This arms race style upmanship is a dead-end. It’s a prohibitively expensive, reactionary, and is a schizophrenic paranoid way of developing software. Organizations following this philosophy can’t envision the future, they can only dwell in the past. They don’t lead, they follow by imitation. If you want to rapidly build a leading solution and not merely mimic existing products, you need to focus on innovation and quality. Some project managers believe that you can only pick three out of the four. 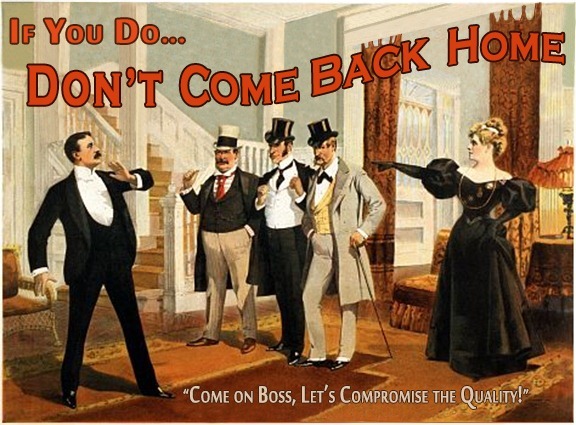 I don’t agree, because quality should never be compromised. would you buy a new car knowing that it has a defective engine or transmission? Most likely not, regardless of how many features it has or if it shipped on time to the dealer. 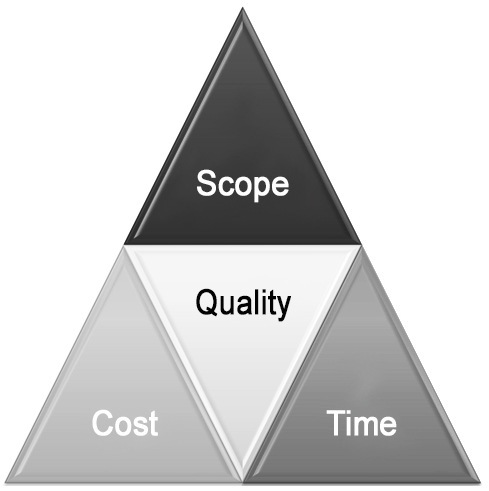 Quality is ‘given’, and as such, it should always be baked into the scope of the project. I’ve seen numerous projects who compromised on quality by reducing unit test coverage and then engaging in creative bug severity reclassification, just to catch up with a slipping shipping date. In the end, no amount of Bondo and marketing spin can cover up the quality holes in your delivery. Still not convinced, check out the annals of software development screw-ups , they are full of product humdingers that shipped on time, on budget, and scope, but failed miserably because of substandard quality. So what do you do when the going gets tough? How do you make that difficult decision and chose the right sacrifice for the greater good? And while at it, what is the greater good anyway? In this posting I’ll share with you a few insights into selecting the lesser of two evils, and some specific project hostage negotiation techniques that may help you get out of some tight delivery spots. On the surface, each option from the list above seems to be equally weighted, but in reality, It’s not as simple. In a dynamic living and breathing project, Schedule, Budget, and Scope actually carry different degree of importance and impact each other in subtle ways. It turns out that rather then a interwoven triangular knot that is made up of equal sides that can be resized and traded equally, the project elements actually resemble an intricate spider web (illustration 3). The structure is controlled by many dynamic factors. As you apply force (i.e. poll or push) to any strand in the web, the whole web flexes and deforms unevenly in multiple axis. 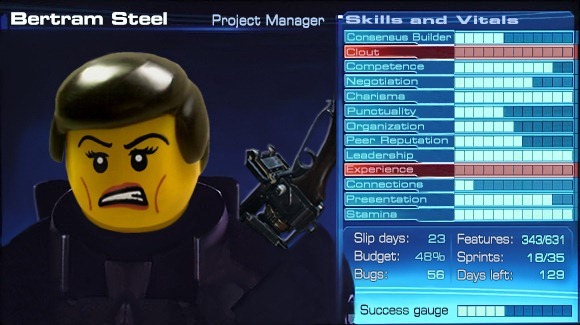 Each change you apply to the project (adding scope, increasing the budget, and etc.) will ripple through the entire project structure like a pebble dropped in a pond. As you can see in Illustration 4, increasing the budget and decreasing the schedule will adversely impact the schedule, scope and quality. This action will also unproportionally deform all project axis and introduce a negative self reinforcing feedback loop. This is because the team will now need to quickly add additional development resources to complete the additional work, this will result investing less time on actual development on more time on knowledge transfer, which will introduce more bugs, which will ultimately result in a reduction of the overall quality of the software. This is counter intuitive to popular wisdom which states that increasing the budget for project can allow you to complete the work faster with more functionality. 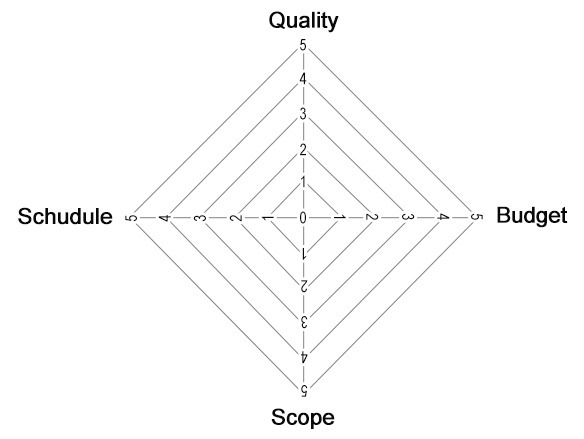 Software product development lifecycle is in many ways similar to a shooter video game. You play each scenes collecting, oxygen, ammunition, and kill points. If you are successful and survive enough missions without losing your vitals (i.e. reputation, stamina, leadership, etc. ), you get to move to the next level and play again. if you run out of ammunition, oxygen, or your life gauge falls below some critical level, you’re out of the game. Following this corollary, your ability to continue to play the software development equivalent of Last Light, depends on your ability to juggle all the elements that go into a project. Here’s an easy way to launch on time and on budget: keep features minimal and fixed. Never throw more time or money at a problem, just scale back the scope. There’s a myth that states that: you can launch on time, on budget, and on scope, while keeping quality in check. Well, it’s nonsense, it never happens, and when you try, quality always takes a hit. If you can’t fit everything in within the allotted time and budget then don’t expand the time and budget. Instead, scale back the scope. You will always have time to add more content later – later is eternal, now is short-lived. Launching early a product that’s smaller is better than launching a solution that is full of holes just because of some magical date. Leave the magic to Siegfried, Roy and, their tigers. Your customer will measure you on how well your features work, not on how many of them you’ve delivered. Less is more. Less code, less documentation, less regression testing. Remove all but the essentials. Trust me, most of what you think is essential is actually not. Keep your solution small and agile. Use rapid iterations to lower the cost of change. And believe me, if you plan to deliver a functional product and are soliciting your users for input, there is going to be a lot of change. Launch frequently, tweak, launch again, constantly improving your solution will help you deliver just what customers need and eliminates anything they don’t. This is an important exercise to go through regardless of project constrains. You have to figure out what’s important for your customer and how you can deliver the most critical functionality in multiple phases. Not being tied to a single monolithic delivery will force you to make some tough decisions, but will also eliminate the need to prostrate yourself in front of the war console. It may sound corny, but having a portion of a working product in the customer’s machine is by far better than having a full poorly functional solution on your build server. The ability to quickly change is paramount for your success. Having scope, budget, and schedule fixed makes it tough to change. Injecting scope flexibility will allow you to be opportunistic in resolving technology and operational unknowns. Remember, flexibility is your friend. 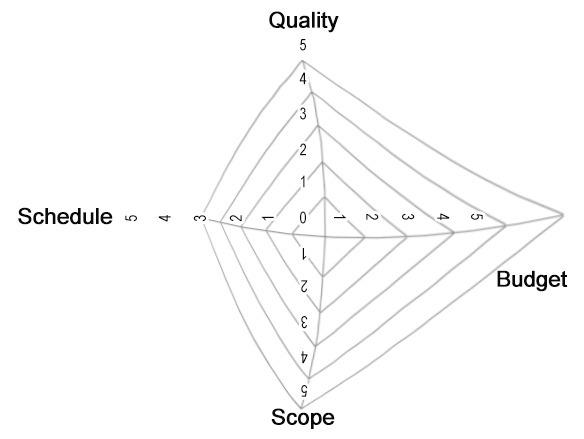 so de-scope, reduce features, and break your monolithic delivery plan to smaller drops. In the end, there is no escaping the proverbial SDLC grim ripper and the fact that you will have to fold. The sooner you show your cards, the better you’ll be in the long run. Delivering less content will allow you to reduce all the fluff that represents managing upwards (i.e. lengthy power point presentations, the fictional development progress reports, etc.) and force you to focus on building the real McCoy. In larger organizations weeks can be spent on planning roadmaps and arguing about the fine details of each feature with the goal of everyone reaching consensus on what would be the ‘best’ solution. That may be the right approach for a $$$ mainframe product, but if you are developing in internet time, fast quality shipping is the way to go. You can always trust the user to tell you if your scope is sufficient. If it’s not, you can always fix it in the next phase and re-ship it again. To succeed in building competitive software, you don’t need an excessive budget, a large team, or a long development cycle. 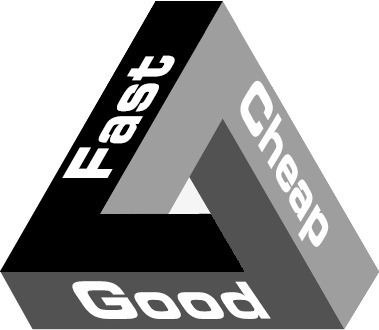 You just need to simplify your solution and deliver it to the customer as fast as possible with the highest quality. Or as Steve Jobs said it “That’s been one of my mantras – focus and simplicity. Simple can be harder than complex: You have to work hard to get your thinking clean to make it simple. But it’s worth it in the end once you get there, you can move mountains” . © Copyright 2013 Yaacov Apelbaum. All Rights Reserved.